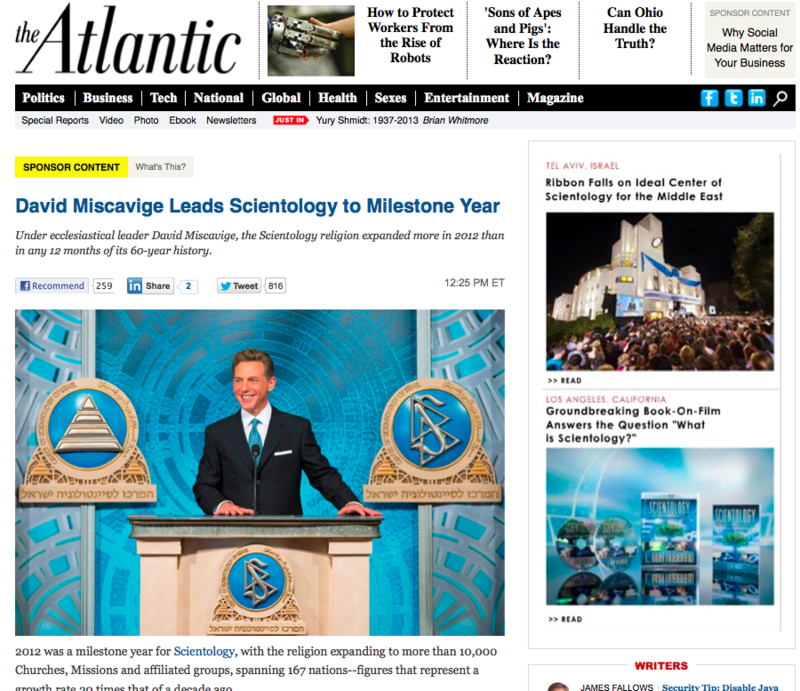 The Atlantic has U-turned on its controversial paid-for feature article from the Church of Scientology. The publication had sparked a debate on media ethics and business models after allowing the advertorial from the religious group to appear on its site but — as of 21:00, UTC-8 — the page now redirects to one with the following message. We have temporarily suspended this advertising campaign pending a review of our policies that govern sponsor content and subsequent comment threads. Update: The Atlantic’s statement is below. The advertorial caused concern for allowing a controversial sponsor such a visible position within the publication’s website, while the publication was also criticized for its decision to moderate the comment sections of the post. 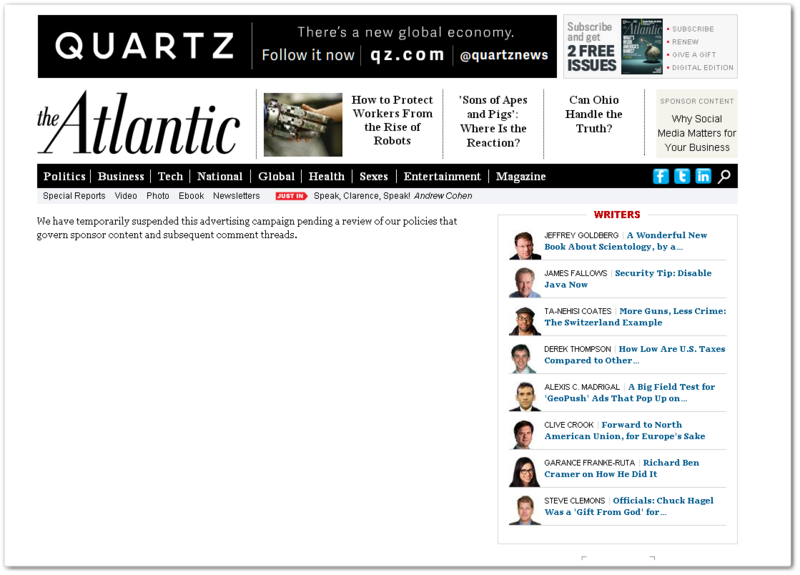 Those issues seem to have forced the Atlantic’s hand and the publication has made an embarrassing about-turn. While monetization is key for online media and readers are able to accept some sponsored content or adverts, this debacle makes it crystal clear (if it wasn’t already — it should be) that the choice of sponsors is reflective of the publisher, and its attitude to its readers…and shouldn’t simply be dictated by money. It’s not clear how the feature managed to make it so far as to be published, so the Atlantic’s inquiry is certainly a required action. The real irony is that the controversy around the removal of the ad could give the Church of Scientology more attention than it could have expected for just one article. That’s assuming that you subscribe to the ‘all news is good news’ theory of publicity. The incident is certainly wholly negative for The Atlantic. Here’s a screenshot of the post, via Business Insider, before it was removed. We’ve reached out to The Atlantic for comment. The move appears to have pleased staffers; senior editor Alexis Madrigal tweeted the takedown of the page and praised one follower for getting this screengrab of the ad in full. Now go and enjoy BoingBoing’s amusing parody: Dread Cthulhu Leads His Cult to Milestone Year. Read next: As rumors of Baidu investment fly, Kingsoft says it is in talks with "independent third parties"